Remember that mom's group St. Patrick's Day party I made the photobooth backdrop for? Well, we're each bringing a treat and I decided to make cupcakes in a jar (because I'm obsessed). 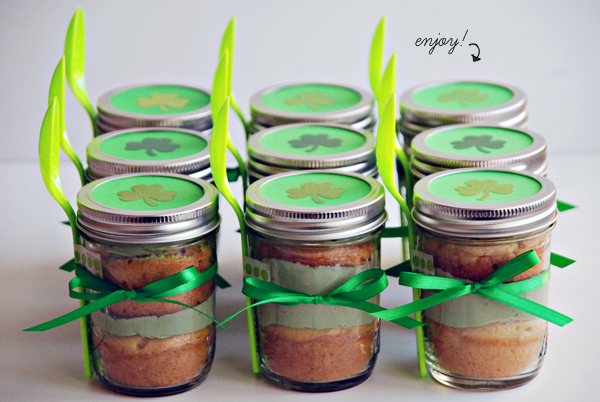 You may have noticed the two cupcakes in a jar I sent my sister in her "birthday in a box". 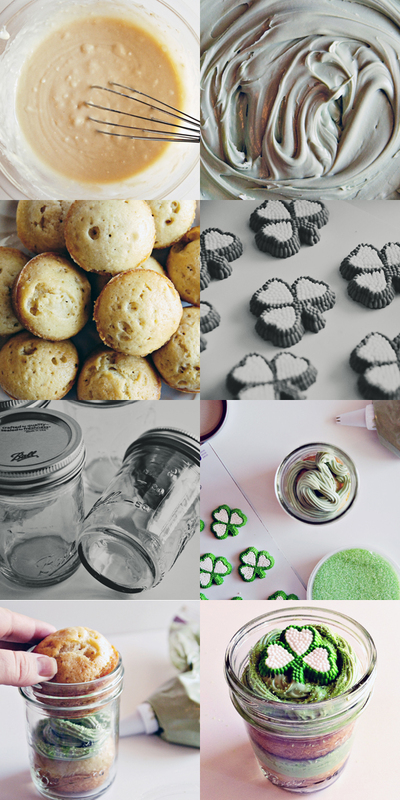 I used the same dairy free cupcake recipe that I shared here, only for these St. Patrick's Day cupcakes I used organic unbleached all purpose flour instead of whole wheat. I've discovered that the type of flour you use definitely has a large impact on the flavor. You can taste the vanilla more in these which my husband really liked (we had to taste test!). For these I used a store bought [dairy free] frosting and added food dye. I only had teal and orange so it came out this muted green but since I was using various shades of green anyway, it worked! 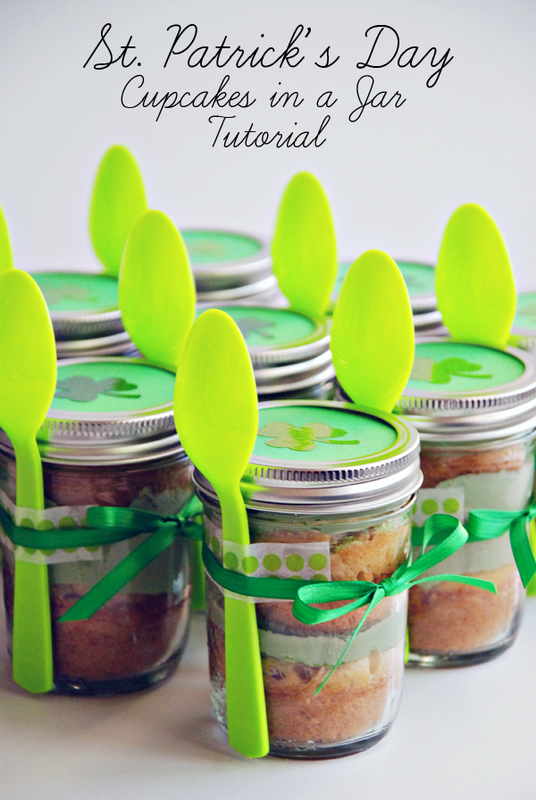 Each jar fit two cupcakes so if you're making 10-12 jars you'll want to double the recipe. I only used about 1 1/2 tubs of frosting and that was after using copious amounts on each! 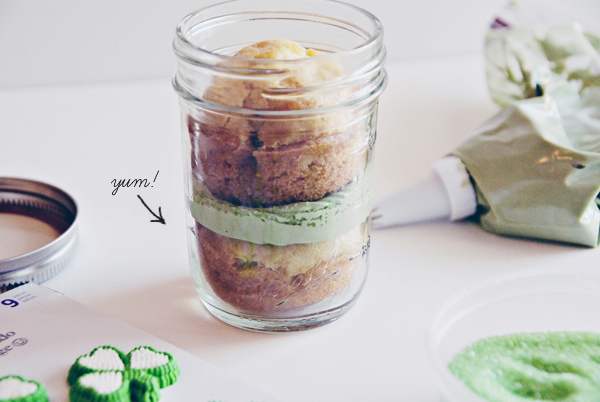 Tip: You don't need to spend much time piping your frosting onto the first cupcake because you're going to squish it when you put the second cupcake in the jar! 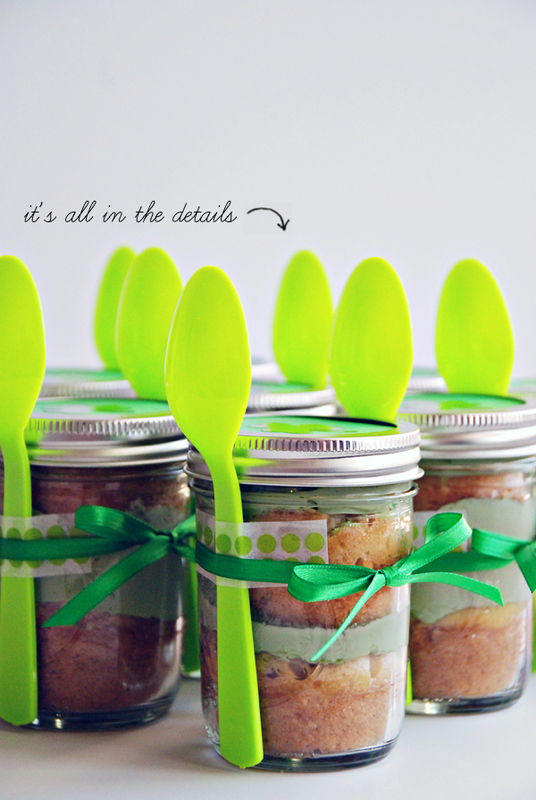 After you have all your cupcakes put together you'll want to embellish the jars! 1. 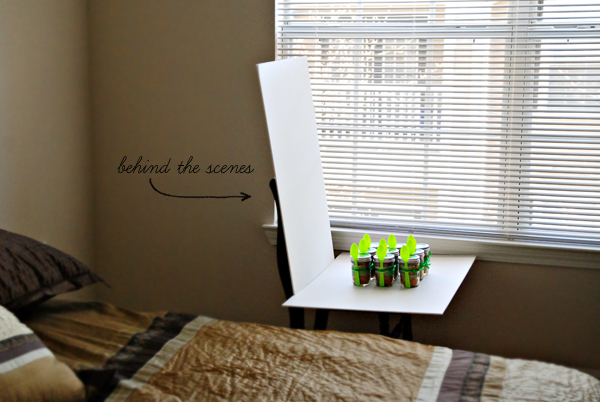 For the lid I used the green cardstock I had leftover from my paper chain backdrop. You can use the insert of the lid to make your circles but since I didn't want to mess up the frosting/candy having already sealed my cupcakes I used the bottom of a Solo cup. Cut as many as you need. I made 10. // 2. You can use adhesive to hold your paper in place while you screw the outside lid on but it's optional. My circles were wide enough that they stayed on without any. // 3. 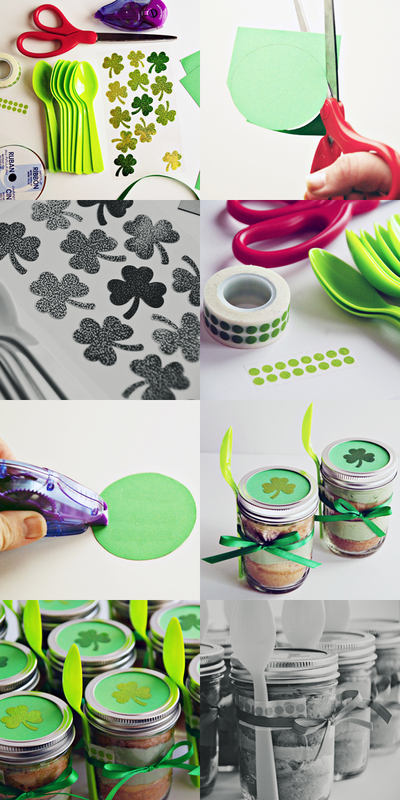 Embellish the top of the lids with stamps or stickers. // 4. 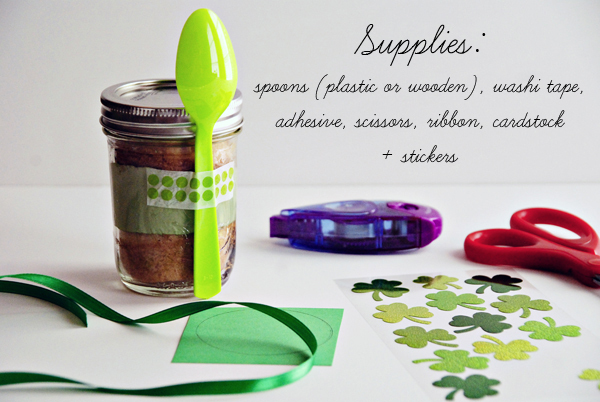 Using washi tape, adhere the spoon to the jar. This will help keep it in place when you tie your ribbon. It's also super cute! // 5. Cut your ribbon to all the same length so that your bows are [relatively] uniform. Mine were approximately 15" long and I trimmed the ends of the bows once they were tied. This was the hardest part of the entire project because the ribbon kept sliding along the glass. In the future I would consider tying a tag or something on and knotting it or using cute fabric instead. I must ask -- where did you get dairy-free frosting?